The Attraction Level (second floor) of the Luxor Hotel contains a number of interesting diversions both for those under 21 and adults who need a break from the tables and slots. I made the mistake of going down and thinking I could do ALL of them in an abbreviated afternoon and opted for the all-inclusive $22.95 ticket. Don’t try this at home, folks! While the $22.95 is a good deal, doing these adventures back to back is time-consuming and taxing. Either plan to do everything over the course of two days or just pick a couple of things to enjoy. IN SEARCH OF THE OBELISK – This $6.00 motion simulator ride is just a little short on bang-for-the-buck. You are led into a futuristic room where you see a video of a “security alert” which sets up the adventure. Then to a waiting room where another 5 minute video further preps you for the ride. This state-of-the-art motion simulator with wrap-around screen does engulf you in the experience, which includes a hair-raising ride through the Obelisk, trying to escape from the “evil forces”. At around 5 minutes, the ride was a little short, although having just had lunch, I was happy to see it end. One of the better standard motion simulator rides in town, even if a bit short and pricey, but go on an empty stomach. 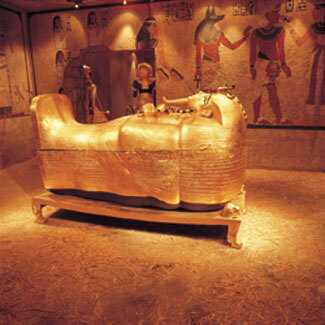 KING TUT’S MUSEUM – A $5.00 rip-off unless you are REALLY into this sort of history, you take a guided tour of replicas from King Tut’s tomb. Seemingly historically accurate, this tour takes about 20 minutes because of the narration you receive from the provided headset. Otherwise, it would take 5. Interesting, but something that should cost $2 tops. WORLD’S GREATEST PHARAOH’S – This 20 minute movie, shown in the same theatre as “Lasting Impressions” starring Bill Acosta, provides a history of the Egyptian period of pharaohs that the theme of the Luxor is based around. Interestingly historical, it’s a nice reprieve from the bells and whistles of the casino. Not something to take the kids too, but at $4.00 not a bad change of pace for an adult.